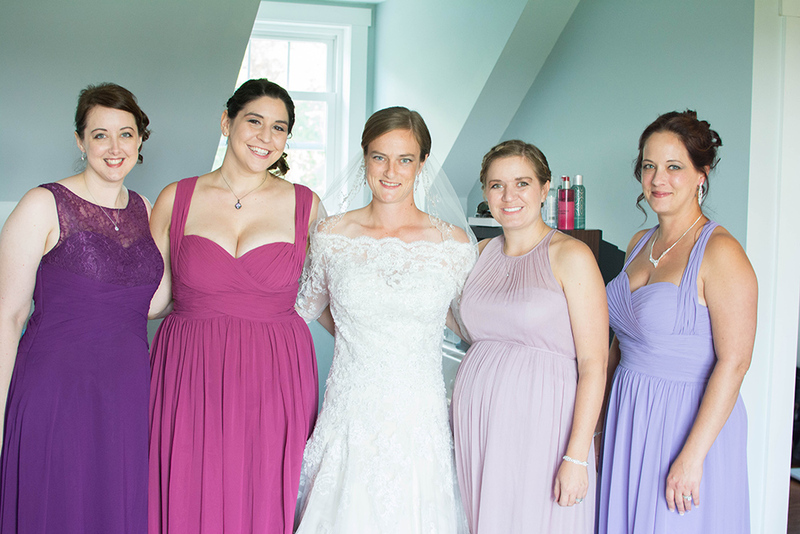 In April of 2018, my best friends Mary and Ryan moved from Baltimore back to Mary’s home and family in North Carolina. They had been renting an apartment in Durham until they were more settled and able to start looking for a house. December 31 they closed on a home in a beautiful neighborhood in Durham to spend the rest of their lives. I was able to see the house when I was visiting them for New Year’s Eve. This is the actual photo that I used to do the painting. 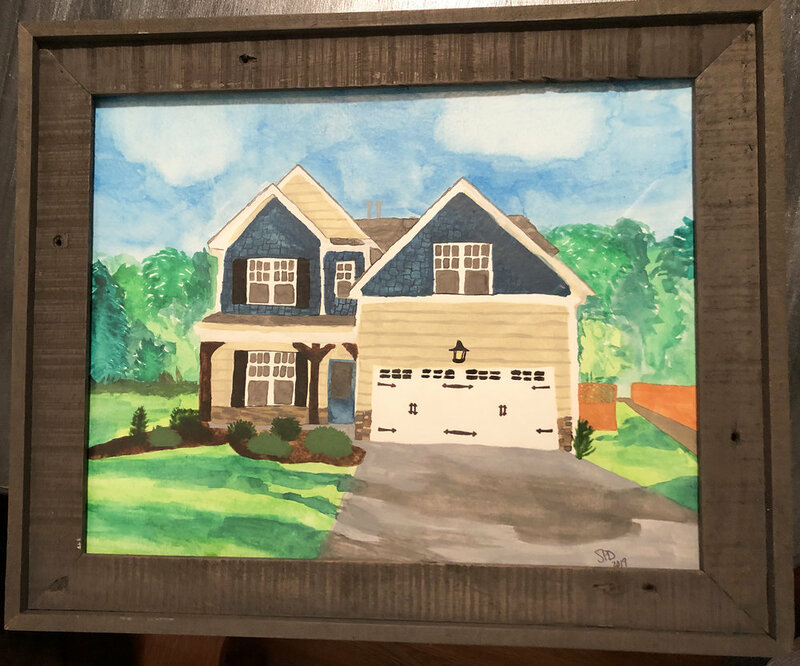 For their housewarming present, I thought I would take a stab at doing a watercolor painting of their home. Here is the final result. Not bad eh! My sister, Elizabeth, will be headed to Kansas City University-College of Osteopathic Medicine this July to begin her time as a medical student. I am so proud of what she has done in the last year preparing and studying for this step in her life. She was actually accepted into 2 doctor of osteopathic (D.O.) programs, KCU and VCOMM-Virigina so she had to make the decision of which school she wanted to attend. When she came to her final decision of KCU, I thought it would be fun to set up a photoshoot for her to make her announcement. Here’s the the next 4 years! Can’t wait to call you Elizabeth Davis, D.O. This past weekend I attended the last wedding of my 2018 weddings. It was a beautiful night celebrating friends of mine. 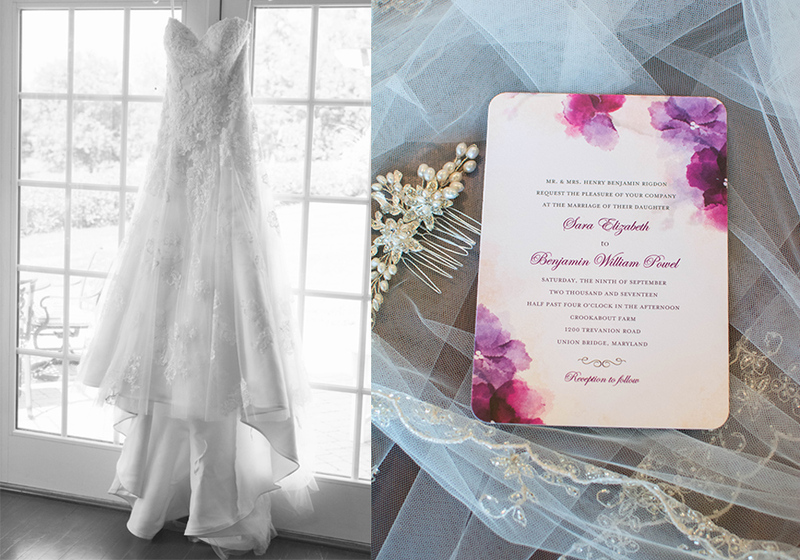 The wedding was held at Liberty Mountain Resort just over the Maryland border into Pennsylvania. The bride, Christina, is a huge fan of Christmas so the reception was beautifully decorated for the evening. It’s too bad the weather had been rainy and warm so all the snow was melted off the ski slopes at the resort. One of my favorite things to do for each wedding I attend is to create an original, hand crafted, meaningful present for the couple. Since Christina loves Christmas, it was easy coming up with the gift for her and Seeley. I created a set of ornaments. One I filled with silver glitter and on the outside painted snowflakes with the date of their wedding. The second, I took their wedding invitation and cut it into strips and curled them up and filled the inside of the ornament. And the third I covered the outside with silver glitter and painted with gold leafing ‘The Seeleys”. Each year when they decorate their Christmas tree they will be reminded of their special day. Was anyone else surprised at the snow storm Maryland got on Nov. 15? For the 4 hours that UB was open, I went out and grabbed a few candids around campus. Edgar Allan Poe could have used a sweater to keep him warm! It’s a great day at work when you get the opportunity to spend the afternoon at the Maryland Zoo. Giraffes are my favorite animal so I was excited to get to spend time with this ‘little’ guy, Willow. Willow is the zoo’s newest addition to the giraffe house being born this past spring. I visited Willow shortly after she was born and she sure has grown since then! Can’t go wrong with a fair classic, the funnel cake. Each summer I anxiously wait for the 12 best days of summer, otherwise known as the Maryland State Fair. For as long as I can remember, from the last days of August through Labor Day weekend have been spent in the Cow Palace at the Maryland state fairgrounds. From being involved in activities from my youth 4-H days of competing in dairy judging, dairy cattle showing, to still participating in the open dairy show and entering a few pictures in the photography competition, I always look forward to the days of the state fair each year. It is a time to catch up and hang out with friends, eat delicious fried fair food and have the opportunity educate the public on the importance Maryland’s agricultural industry. This year I had 5 entries in the photography competition but unfortunately no ribbons were won. I also exhibited my red & white Holstein dairy calf whom I own in a partnership with my sister and two of our friends. We got a 5th place ribbon in the fall calf class. Bagel on the beach anyone? I spent the other weekend at my best friend's family beach house in Sunset Beach, NC. Her parents has asked me a couple months ago to come up with a design to paint on a window frame that they had recently installed into their stairway. I came up with the idea to paint a sunset scene since their beach house is in Sunset Beach, NC. A very rainy day over the weekend and I got to work on the painting. A good friend of mine started a fitness instagram account that highlights her workouts, meals and daily life while educating consumers on the importance of including dairy products into your fitness routine. When she asked me to design the logo that would become her brand, I was super excited to be involved in the project. Growing up on a farm, I had been raised my whole life eating dairy products and educated on the importance of milk in your diet. I was pleased that I could be able of her mission to show the general public that dairy isn't a scary thing. Make sure to check out the good work Emily is doing on her instagram, @dairygirlfitness. Here are the sketches I presented Emily to choose from for her brand. 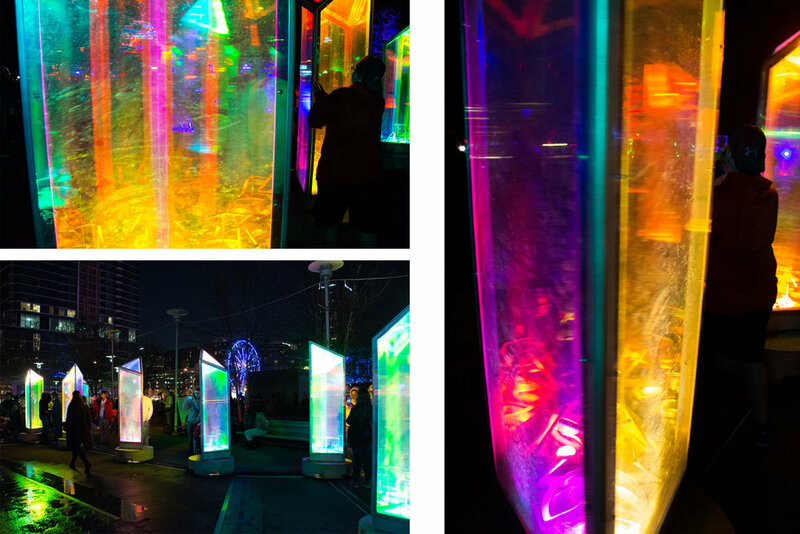 This past spring was the Light City Baltimore festival. It's a free festival of light, music and innovation put on by Baltimore Office of Promotion and the Arts. There are many exhibits along your way from Harbor East to downtown inner harbor. Lots for the public to look at. And makes for pretty pictures. I just finished up a logo for a new client. 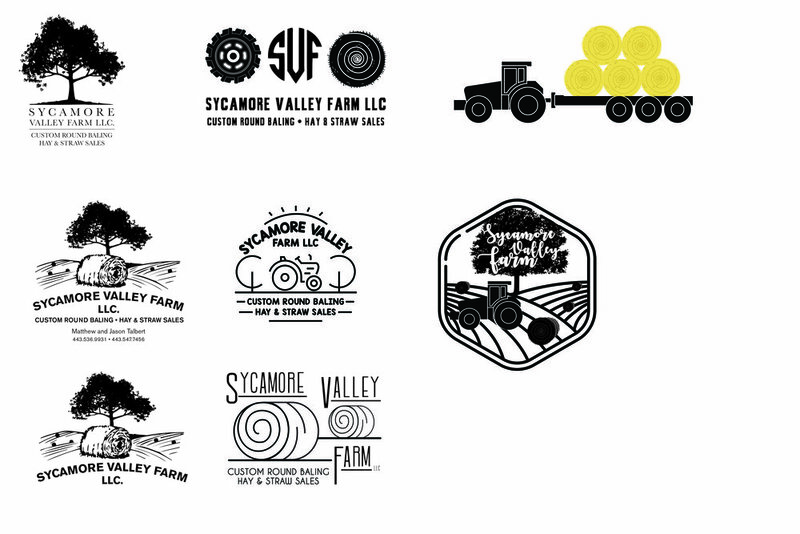 A set of brothers were looking for a logo to represent their business where they bale and sell hay and straw. Logo options that I presented the client with. This past weekend I traveled to Raleigh, NC for a close friend's wedding. A few months ago they had asked me if I would be willing to take on the task of designing the chalkboard wall at their venue, The Stockroom at 230. I said I would be happy to do it, not knowing what I really was signing up for. When my friends told me the dimensions of the wall, I freaked out. I am very comfortable with doing chalkboard signs at 18"x20" where I can easily stencil out the design. This task however was a wall 8' x 10'. A large scale than I have ever tackled. I did my prep work; came up with the design, got my supplies and gridded out the letters for reference points. And I decided I was just going to tackle this the best I could. When I arrived on the scene I was very nervous now that I was actually in front of the wall and seeing how large it was. Once I got started, I got more comfortable at working at the large size. It took a few tries for certain letters, and i was pretty uneasy hanging off the side of a ladder but I managed to get it done. I recently had the opportunity of attending the AIGA Design Conference in Las Vegas, Nevada. As my first conference ever, it sure blew me away. Not just because I was in Vegas for the first time but because AIGA did a fantastic job putting together a program that was engaging, exciting and informational. 3 days of design filled activities had me busy from 8am to 8pm! On Monday I went to a session called Emerging Designers Symposium which was really helpful to me personally since I am only just starting out in my design career. 3 speakers talked about how you juggle different job opportunities to lead you in a direction that works for you. In the general session on Monday, the big main stage speaker was Paula Scher, who is a partner at Pentagram, one of the best design firms and she happens to be one of my favorite designers. I love the work she has done and it was truly amazing to be sitting in the audience listening to her advice. I had done a presentation on her in college so it was so cool to be sitting there listening to her present to me! Through out the three days I heard from so many different speakers with talent in all sorts of design fields. It was so amazing to see how everyone depicts design so differently. Some of my favorites that stood out were Gemma O'Brien, she is an Australian hand-lettering artist who dropped out of law school to start lettering. Now she does these amazing giant wall hand-lettering designs that are breath taking. We heard from Michelle Stanek who decided to put her art history curating career on hold to become a pole dancer. And we even got a performance! Chuck D, the rapper from Public Enemy gave a talk about designing album covers and then turning to performing music himself. Quindar, which is a musical duo of two guys in business suits playing scores and sound bites from space and time. And it was an amazing opportunity to meet people from all over the USA and even international designers. My favorite speaker was Sebastian Padilla, co-founder of Anagrama studio in Monterey, Mexico. He does amazing design work and the best part is that he says that he isn't even passionate about design. He didn't even want to be a designer. He struggled in school and so he thought choosing design would be an easy way for him to pass school. But he has come a long way and Anagrama has a lot of top notch clients. But he struck a cord in my heart because he talked about how much he loves tacos. I did have some time to enjoy Vegas as well! Like walking down the Vegas Strip, watching the fountain show at the Bellagio, going into the different hotels. I even got to enjoy a west coast stable, In-N-Out Burger! I can now check that off my food bucket list. The conference was an amazing time and I am thankful for my employer giving me the opportunity to attend.